Chances of winning an NFL game with four-plus turnovers? One in five! We can all agree that committing four or more turnovers in a game will probably not lead a team to victory, right? 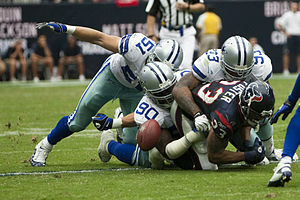 According to research conducted on the Pro-Football-Reference.com website, there have been 3,301 times since 1970 (the AFL-NFL merger) when a team committed four or more turnovers in a game. In those 3,301 games, the team that had four-plus turnovers won 651, lost 2,634 and there were 16 ties. That puts the winning percentage of a team committing four-plus turnovers in a game at .200 (a one-in-five chance that an NFL team will win if they lose the ball four or more times in a game). It’s interesting to note the .200 winning percentage number because this year, 2013, there have been 15 times when a team had four-plus turnovers; three teams won, 12 lost. That’s a .200 winning percentage for 2013. The three teams that won games when they had four-plus turnovers this year? Chicago, Cincinnati and Cleveland. If we expand the parameters a bit and look at the numbers going back to 2010, there have been 156 games when a team had four-plus turnovers. Teams are 20-136 in such games, a .128 winning percentage. Following are the teams that have won the most games when they committed four-plus turnovers. One final note: If we go back to 1970, only three teams have won 30% or more of their games when they had four-plus turnovers in a game. Leading the list are the Raiders who have a .357 winning percentage in games when they commit four-plus turnovers. They are followed by the Steelers (.324) and Texans (.308).